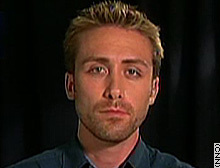 (CNN) -- Philippe Cousteau, grandson of famed ocean explorer Jacques Cousteau, was working with Steve Irwin on a Discovery Channel project called "Ocean's Deadliest" when the popular TV naturalist died this week in a stingray attack. Cousteau joined "Larry King Live" from Cairns, Australia, to talk about his impressions of Irwin and the legacy of the "Crocodile Hunter." KING: Philippe, what were you doing there? Where were you, and how did this all come together for you? COUSTEAU: ... Steve was in the water actually when all of this happened obviously, and I was on the boat. I was reading a book when we got the call over the radio. We had been about 10 days or so into the shoot, and things were going so well, and I think that's, you know, the irony of the whole story was that stingrays weren't even part of, you know, the show. And so I was actually just relaxing and getting ready for our dive that afternoon when everything happened. KING: How did you and Steve get together on this? COUSTEAU: Well, I had been working with Animal Planet now for a few months on various different projects, ocean-related projects. And I got a call about a couple months ago from a producer at Animal Plant, at Discovery, asking me if I would consider working with Steve on a project called "Ocean's Deadliest." And I jumped at the opportunity, especially once I learned the strong conservation message that would be part of the film and just really looked forward to working with Steve. And over the last few months we've just been scheduling and putting it together, and it all came together beautifully. And I've been here for a couple weeks now and it was -- it was up until that tragedy quite a wonderful experience. KING: Tragedy has been around you. Your father died in a seaplane accident. How are you dealing with this? COUSTEAU: You know, that's one of the things that has haunted me a little bit since this occurred -- that I was there -- the circumstances around Steve's death being such an accident and also my father's death was an accident, and he left two children, a son and a daughter and a widow. And the situation is so similar. That's been difficult, I have to tell you. KING: Philippe, I'm sorry. ... What was your take on Steve? COUSTEAU: You know, I remarked in an e-mail not long after I arrived in Australia and met Steve, we were up north catching saltwater crocodiles, and I spent the second day with Steve hanging onto a 15-footer. It was pretty, pretty amazing. I wrote an e-mail to some of my colleagues and friends back in the States how amazed I was at how dedicated Steve was and how much he really loved being out there, being out in the wild with those animals and also how much the people around him cared for him and loved him, and the high esteem in which his entire team held him and how much he loved them. They were ... his family, and I have never seen a closer group of people that were more dedicated to each other, and he was so humble and just part of the team. And when we were doing some public shots at the airport, you know, I mean he's mobbed all the time, and he was always gracious and kind, and he was -- I was struck immediately by that and just what a remarkable individual he was. KING: You go around dangerous things. Does this give you pause? Might you not go out on things again? COUSTEAU: Absolutely not. It was a freak accident, but it doesn't stop us from doing what we have to do to bring the wonder of nature and all of these creatures to everybody. And that's what was so important about this show, and I think why Steve was so excited about it that we were looking at these animals that people think of as, you know, dangerous and deadly monsters, and they're not. They all have an important place in the environment and in the world. And that was what his whole message was about. And I know all of us will continue to fight to bring that message to everyone. KING: [Irwin's friend and manager] John [Stainton] mentioned that you will continue with the project. Will it be difficult to finish it off without him? COUSTEAU: Larry, it's going to be -- it is definitely going to be very difficult to finish this show, not just for myself but for the incredible crew that is so dedicated to doing so. But we feel it's, you know, when John asked me to do so, I was honored to be able to continue this show. Steve and I spoke at length about why he does his work and the show in particular and just work in general. And you know, by far and away, humankind is the deadliest creature in the ocean. And if we can help bring that message to people around the world through this program and help them understand that all these animals have an important place in the world, then he'll be -- I think he'll be proud of that. And you know, something that he told me many times, and we discussed at length as well, that coming out of this, what -- if there's anything that individuals and people can do, it's support conservation. Supporting conservation, supporting wildlife, and understanding that we all have a place in this world, and it needs to be respected. KING: And Philippe, when does the project start to continue that you'll finish? COUSTEAU: Well, Larry, that's up to the family and to John. But we're working on that now. And the crew is dedicated. And let me just say thank you for allowing me to share thoughts about Steve, and also that it was a real honor to have shared the time with him that I did. KING: Thank you. You come from a great family. Don't you think your grandfather would have loved Steve? COUSTEAU: I know he would have.